T.E.K. Industry Australia have developed a mobile concrete batching plant called the TEKMIX6000. The TEKMIX 6000 is an equipment unit with many advantages. It offers an economic benefit potential through reduction of transportation costs. It has adequate installed power and so is protected from overloading. With advanced design and increased productivity speed, it can produce up to 150 tonnes of concrete per hour, 24 hours a day. The TEKMIX 6000 mobile concrete batching plant has its own inbuilt generator and automatic computer. The TEKMIX 6000 mobile concrete batching plant is 13.6m long, and T.E.K. Industry Australia say that it can be towed by a truck to where it is needed. The TEKMIX 6000 mobile concrete batching plant can be fully erected and in use within three hours with the use of a small crane. The same time is also required to disassemble the machine and have it ready for transportation. The TEKMIX 6000 mobile concrete batching plant can also operate on any ground surface without any need for special ground preparations. The TEKMIX 6000 mobile concrete batching plant is able to operate with electricity from a power grid or through an autonomous power source provided by a 150kW generator already mounted on the machine. 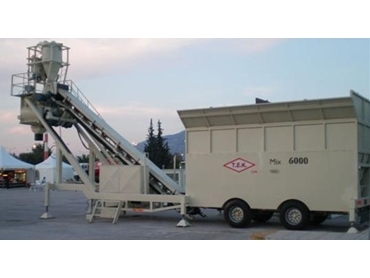 The TEKMIX 6000 mobile concrete batching plant can be operated electronically as well as manually. Through eight automatically operated doors the raw materials are put onto the conveyor belt and subsequently transported to the mixer. A water pump transports the water to a measuring balance in the mixer.